In the winter of 2017 an unseen part of breather pipe to the engine anti-syphon, had been cabled tied initially to another pipe too tightly and caused seawater to enter the engine after it had been run. Rather than strip and repair, the owners had the entire engine block removed (1,325 hours) and a brand new one installed and the breather pipe re-routed. The new replacement engine was fitted by Volvo Engineers. She has a lovely and comfortable passage-making capability and at the same time has shown a good turn of speed - Overall Winner (Class III - under 60') at the 2014 Oyster Palma Regatta. In Spring 2018 whilst out of the water in dry dock and with two new coats of antifoam, her hull was polished before being put back into the water. She was sailed from Palma in Mallorca where she had been looked after by Oyster Palma Guardienage, to Menorca and after 6 weeks there sailed to Southern Sardinia, and then to Northern Sicily and the Aeolian Islands before journeying for her Winter berth at Marina Di Ragusa on the South Coast. She was specified for comfortable cruising and the ability to be sailed by a couple who are retired - so she has no pole fitted and no spinnaker, but her rigging was fitted out with a pole track and fittings in place, including lines, so that everything is there for these two items to be installed. The initial passage from the UK and across Biscay to the Mediterranean was mostly calm. 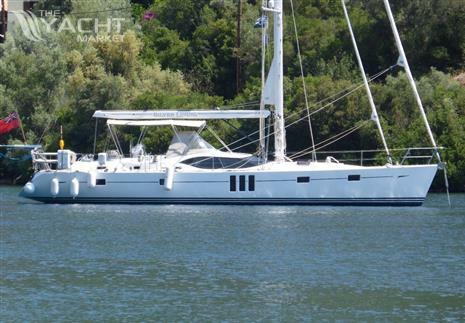 The owners prefer to sail in lighter winds, so the yacht has not been stressed and is in lovely order. She has visited the Balearics, Corsica, Sardinia, Italy (and the lovely Amalfi Coast and Capri), Sicily and the Aeolian Islands, Malta, Italy, Ionian and Aegian Greece and Turkey and has been a very safe yacht for the current owners.